A new podcast from the Bill & Melinda Gates Foundation will highlight the changing profile of today's college student and the ways higher education must evolve to support student success. 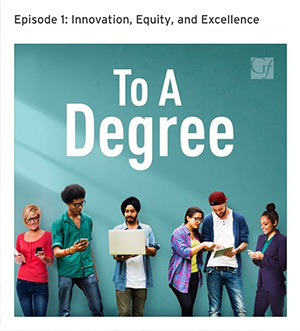 The series, called "To A Degree," will cover "the people, institutions and organizations that are working to provide all students with a high-quality and affordable postsecondary experience, especially those at the greatest risk of being left out," according to the podcast website. Bridget Burns, founding executive director of the University Innovation Alliance, and Deborah Santiago, co-founder, chief operating officer and vice president for policy at Excelencia in Education, talk about how data can inform student retention, the need for innovation to promote student success, and the importance of inter-institutional collaboration in tackling issues of equity and excellence. The podcast is available for free to stream or download at toadegree.com, or through iTunes.